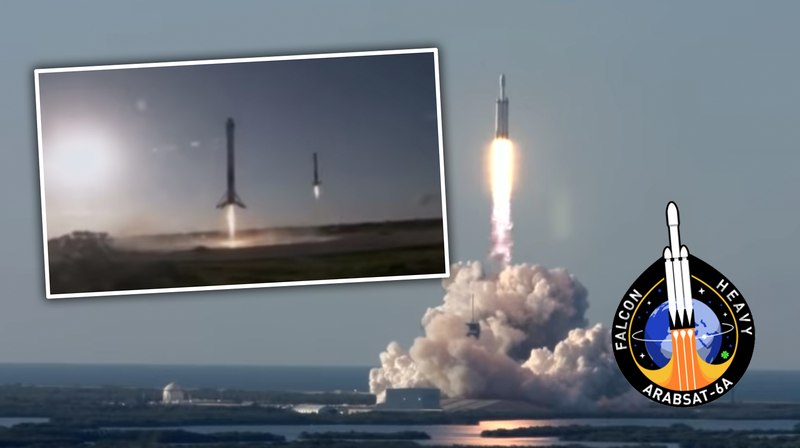 For the first time ever, yesterday, SpaceX managed to land and recover all three of the Block 5 Falcon 9 rocket boosters that, when combined, form the Falcon Heavy launch vehicle. While the idea of vertically landing a rocket after launch for re-use has been around a while, SpaceX was the first to actually do it, and this triple-landing, part of the Arabsat-6A launch, is the first time three boosters from one launch have been recovered. 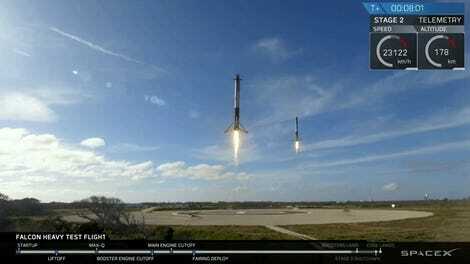 The SpaceX Falcon Heavy is made up of three Falcon 9 rockets acting as a first stage, each with nine Merlin engines, and one Merlin engine on the second stage. Those 27 first-stage engines make the Falcon Heavy the most powerful rocket currently in service, and the third-most powerful to reach Earth orbit, after the Soviet/Russian Energia and the NASA’s Saturn V moon rocket. Of course neither the Saturn V nor the Energia were re-usable, which is what makes yesterday’s landing and recovery of all three first stage rockets so remarkable. The two side boosters were the first to land, touching down on landing sites nearby the Kennedy Space Center’s Launchpad 39A (the one used for the Apollo moon launches) as they were jettisoned before the central core booster, which itself landed on SpaceX’ drone landing pad in the Atlantic, sentimentally named Of Course I Still Love You. This marks the second successful flight of the Falcon Heavy, which first launched in February 2018, when it put Elon Musk’s old Tesla Roadster into space with its Starman occupant. The Falcon 9 rocket stages that make up the Falcon Heavy have been improved to allow more reusability. Initially planned to only be re-used three times, improvements to engines, a more rugged interstage adapter section, better thermal protection, and more should now allow each booster to be good for up to 10 launches with effectively no between-flight refurbishment. Considering this sort of vertical-landing and reusability was just a pipe dream not even five years ago, this is extremely impressive.